In most solar heating applications the solar collectors are exposed to periods of freezing as such the solar heating heating fluid needs to be able to with stand freezing. This is done through the use of mixing water with specially formulated solar glycol to avoid freezing and large scale damages. By code, any solar application involving potable drinking water must use a non toxic blend of solar glycol known as propylene. This is a food grade glycol and is non toxic. However, when selecting a propylene glycol one must be careful as all are not the same. Glycol used in a solar water heater is unique and must have a few features that regular propylene glycol does not have. 1st it must be able to with stand extreme high temperatures that can and will occur in a solar system including stagnation temperatures that can reach 410 F. Most glycol will break down and become acid needing immediate replacement if those temperatures are reached. 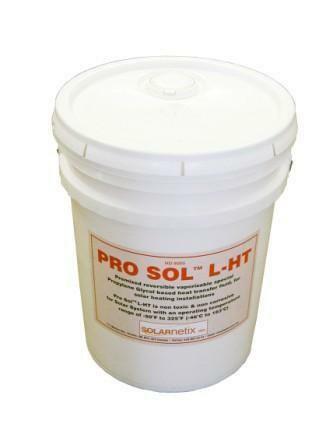 Solar glycol such as ProSolTM L- HT is rated to 425 F with short periods of up to 475F. The other factor specific to solar glycol is is ability to completely vaporize or steam when stagnation temperatures are present. When a collector steams, the liquid is forced out the hot manifold and into the increased pressure is absorbed by a properly sized expansion tank. This characteristic means that no hot solar glycol remains in the collector manifold for any long length of time reducing the chance of deterioration. ProSol™ L-HT is a clear, yellow colored, practically odorless liquid, based on virgin (not recycled) propylene glycol, water and specially designed industrial package of liquid inhibitors. It has been designed specifically for use as a heat transfer fluid in solar thermal systems operating under elevated thermal conditions (vacuum tube collectors). In case of stagnation those components evaporate together with propylene glycol and water, the collector remains empty,and no damaging insoluble residues will cause any flow obstruction or blocking. The corrosion inhibitors contained in ProSol™ L-HT reliably provide protection against acid corrosion, scale and sediment formation in systems with materials normally used in solar thermal installations.The acid neutralizing agent of ProSol™ L-HT buffers any acids formed as a result of glycol oxidation. Mineral deposition preventative acts to prevent minerals from depositing on the surface walls of piping systems and heat exchangers. Mineral sediment preventative keeps free-floating minerals in solution from precipitating out. This additive prevents mineral salts, or clusters of mineral salts, from forming large enough particles to precipitate, or drop, out of solution. If the system is prudently engineered, ProSol™ L-HT consistently ensures high thermal efficiency of the solar thermal system. The solar heating system must be protected in respect to temperature, pressure and discharge of liquid in accordance with local regulations. The collector circuit must be protected in such away that at the highest possible collector temperature (stagnation temperature), no heat transfer medium will escape from the safety valve. This could be achieved through the appropriate sizing of the solar expansion tank and matching of the operational system pressure. For ProSol™ L-HT a maximum bulk temperature of 325„F (163„C) is recommended, with film temperatures not to exceed 375„aF (191„C), it can tolerate brief temperature excursions up to 100„F (56„C) above the maximum recommended temperatures. Tests have shown that the heat transfer medium is under less stress during stagnation than when it is just below the steam building phase. All of the data sheets of the collector manufacturers list stagnation temperatures above 400°F (200°C). However, extended exposure of the fluids to temperatures in excess of 50„F (28„C) above the maximum recommended temperatures will result in accelerated degradation of the glycol and inhibitor systems. On the other hand, these temperatures generally only occur during operation with dry steam, i.e. when the heat transfer medium has completely turned to a steam in the collector or the collector has been completely emptied due to steam. The wet steam then dries quickly and is no longer able to conduct heat. It must be ensured that all of the heat-transfer fluid can escape out of the solar collectors into the- sufficiently dimensioned solar expansion tanks when the maximum static temperature is reached, and thus the collectors remain empty. Warning: In order to maintain its specific properties, ProSol™ L-HT must not be mixed with other heat transfer fluids, or diluted by water. If leakage or other pressure loss happens, the heat transfer fluid in the system must be refilled with ProSol™ L-HT only.